stop that cat. you cannot eat that robot. robots are not for eating they are for performing human tasks. and don’t think you can destroy the robot and then just do what he does. you can’t really do what he does because you are a cat and you don’t have thumbs. Normally I am right there with this Tumblr’s stand against cats being where they do not belong. However, the caption for this picture is VERY WRONG. That is not a robot, that is a DALEK. And Daleks are not for performing human tasks, they are for destroying all things not Dalek. So, in this case, the cat is being extremely brave and heroic by destroying the Dalek before it can destroy us. You go, cat. You get that Dalek and you get him good. Oh, that’s brilliant! 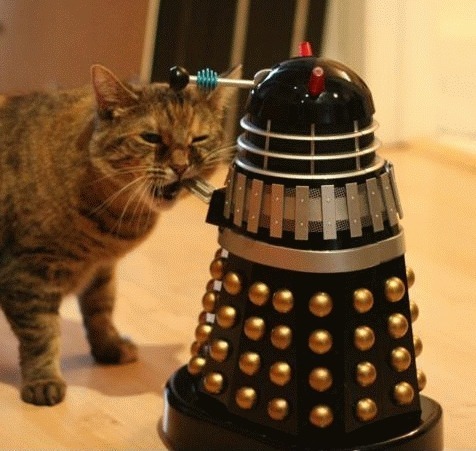 And yes, kitty should totally destroy dalek. In every case.